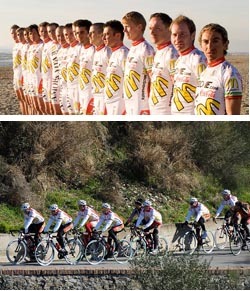 Velo Vie Bicycles announced their new sponsorship of Italy's world renowned pro cycling team, Amore & Vita-McDonald's. Amore & Vita means 'love and life'. Formed by Ivano Fanini in 1948, this talented team has promoting the message of clean sport and solidarity through cycling. Amore e Vita has won more than 3000 competitions around the globe, including 12 World Championships and 50 National Titles. Velo Vie Bicycles will provide 4 of its top of the line carbon fiber bicycle models for the team, including a custom designed frame from the Vitesse 300 line created especially for the 2008 race season. "Velo Vie has a wide range of products for our team- along with great service," says Cristian Fanini, team director. Velo Vie's Vitesse 200, Vitesse 300, and Veloce will round out the Velo Vie line up. Amore e Vita has a formidable team of cyclists for the 2008 season. The Amore & Vita-McDonald's leaders this season will be Olympic mountain bike champion turned roadie Miguel Martinez, and 6 time Giro d'Italia stage winner Ivan 'The Cheetah' Quaranta. They have both expressed their enthusiasm to ride such a high quality bicycle in Velo Vie. Ivan Quaranta states, "All of my previous frames were custom made for me. This is the first time I have used a stock frame. The Vitesse 300 is the stiffest frame I have ever used for descending, climbing, and especially sprinting where it really matters for me." Amore e Vita-McDonald's will ride Velo Vie in races across Europe, North, and South America in 2008. Homayoon Farsi of Velo Vie states, "Amore e Vita has some of the most talented cyclists in the world. The selection of Velo Vie's product line endorses our products internationally and promotes Velo Vie, Bike Life, across the globe. Feedback from Amore e Vita-McDonald's professional riders has exceeded our expectations," says Farsi. Miguel Martinez explains, "I like the stiffness of the Velo Vie Vitesse 300 much better than frames I have used in the past." Amore & Vita-McDonald's is the first pro team and European team sponsored by Velo Vie, following a tremendous showing of U.S. Velo Vie teams for the 2007 season. Some highlights of the 2008 race season for Amore & Vita and Velo Vie include Trofeo Laigueglia (ITA), Settimana Coppi Bartali (ITA), and Giro della prov. di Lucca(ITA). Velo Vie is an Arizona-based company that manufactures and sells high performance and racing bicycles direct online. Founded in 2006, Velo Vie offers highly customizable bicycle frames featuring Velo Vie" Carbon Axis technology. Velo Vie offers consumers top quality components through its relationships with manufacturers such as Shimano, Campagnola, SRAM, Zipp, Fulcrum, Reynolds, Easton, Vision, Profile, Ritchey, FSA, Deda, Rolf, Time, Speedplay and Look. For more information about Velo Vie visit www.velovie.com. Contact info press@velovie.com or call 1-877-VELOVIE.